This book takes stock of learning theories in the European Union (EU) integration literature and assesses what insights the concept of ‘learning’ has added to our understanding of the European integration processes. Given the European integration dynamics since 2000 (including enlargement and new governance approaches and instruments), learning and learning-related theories have gained major EU significance. The book addresses the less noticed micro level patterns of behavioural change that deserve more visibility in the EU's theoretical toolbox. It focuses on the conditions under which EU actors in various decision-making processes learn or do not learn. In asking this question it raises issues about the EU’s nature. Do the EU conditions that favour learning outweigh the EU conditions that inhibit learning? Is the EU system too complex for learning processes to have a discernible, concrete impact? To assess the degree that the EU system and its member states learn, the authors selected for this volume are all explicitly comparative in their approach, and have been encouraged to look at differences across political systems. 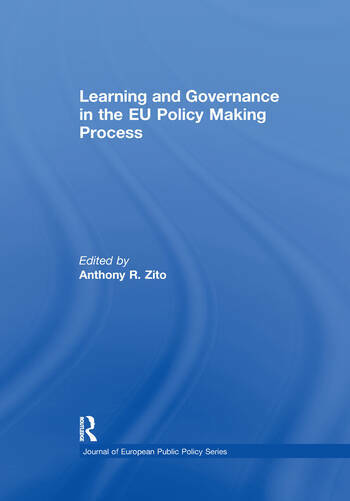 In doing so, the authors study how EU member states, EU institutions, and other groups and organisations pursue learning across the multi-level EU policy process. This book was previously published as a special issue of Journal of European Public Policy. Anthony R. Zito is Reader in Politics at Newcastle University and is currently Politics Research Director and Co-Director of the Jean Monnet Centre at Newcastle University. His broad research interests focus on the European Union decision-making process, policy-making processes and expert networks. Dr. Zito was a 2007 Leverhulme Fellow, conducting a comparative analysis of EU and United States environmental agencies. He has authored Creating Environmental Policy in the European Union (Palgrave 2000) and articles in Political Studies, Public Administration, Governance, Journal of European Public Policy and other journals, focusing on the EU policy process and environmental actors and policy-making.